I'm so shocked she was let into your suburb, let alone your front door! PeeGee is sweetness compared to this bit o' cheesecake. Is true that most of the girls are fairly (or unfairly) exposed in comic books... But is not like all the guys have body armor, they are wearing tights and their underwear is outside of their pants, so if you think for a sec, they're not that comfortable either. Anyway, when I get my hands (professionally speaking) in the Infinite Crisis or the announced DCUC Power Girl, no complains will be heard. Well, I can see the complaints about the Phanotm Lady one, but the spirit of it reminds me of the Adult Supergirl bust - where she's pulling away her white shirt and going Shhh! It's cheeky, it's flirty, but it's not a disaster. Maybe i'm mellowing. Having said that, although I find it a bit endearing I'd be embaressed to have it on my shelf. Unless it's in line with Phantom Lady's characterisation? 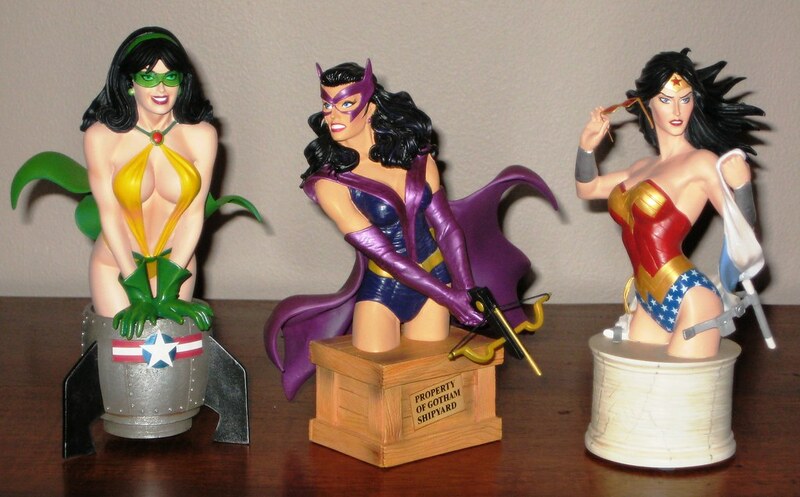 The Huntress and Wondie ones are wonderful though. I would be totally in love with this mini-bust if not for those "dish-washing rubber gloves?". Just a minor complain, though. He´s in my wish list anyway.